Editor's note: This post was originall published in June 2015 and has been revamped and updated for accuracy. 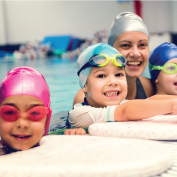 Click HERE to sign up for swim lessons this season. My son will be three in September, but from the time he was born he has been a natural water baby. He took to the pool immediately with zero fear of the water. He loves to jump in, put his head under the water and “swim” for hours on end. As his parent, I’m equally pleased and terrified just how comfortable he is around the water. I want Benjamin to love swimming, but I also want him to understand the boundaries and safety rules associated with any body of water. As an active family who loves to swim, we decided it was time to enroll him in swim lessons and harness his desire and lack of fear into a skill set. Thinking about the benefits of a family gym membership? 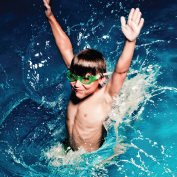 We signed Benjamin up at the Carmichael/Arden Club for two weeks of private swim lessons. I’ll be honest, I had no idea what to expect. I wasn’t sure how my shy little boy would do with an instructor he had never met or how much he would be able to learn at this age. The instructor, Mister Zach, was awesome. I cannot praise or recommend him enough. If you live in the Carmichael/Arden area and are considering swim lessons for your child, look no further. He is patient (even when your child is screaming in his face), kind, fun and will push your child to try new things, but with an understanding of their limits. The first two lessons were a little rough. Benjamin cried and screamed – unsure about Zach. But on day three, magic happened. Benjamin waltzed in like he owned the place, happily said hello to Zach and hopped into the pool like the last two days never even happened. From there, Benjamin made great progress at every lesson; from blowing bubbles to kicks, and back floats to keeping his eyes down in the water, I could see firsthand he was obtaining new skills. By the time our two-week swim session had ended, Benjamin went from wild and crazy man in the pool, to developing a greater understanding of water safety rules, as well as he developed some of the basic skills needed to swim. 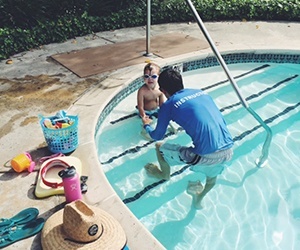 Swim lessons quickly became the highlight of Benjamin’s day, as he always excitedly talked about “swimming with Zach in the big pool”. We had such a great experience, and Benjamin made so much progress, that we signed up for a second session of swim lessons with Zach. Good thing, because ever since they ended Benjamin has asked about Zach twenty times a day (and that’s not an exaggeration). I wasn’t sure if swim lessons at two-and-a-half were necessary, but after seeing how much Benjamin learned in just two weeks the investment was 100 percent worth it. Not only did he learn a lot, but he loved them. Besides, how cute does he look in these swim goggles? !